Here in the northland we are in the odd time of year where the weather is still mostly warm, punctuated by random cool days as fall approaches. That means abundant tomatoes and other garden vegetables along with the early apple harvest. We do not have our own apple trees. If we had planned on staying in this house we would have planted two or three apple varieties this spring. But even without trees we have an abundance of apple orchards nearby. So this morning we went on our first apple picking of the season. My little girl loves riding around on her daddy's shoulders so she can pick from the top of the apple trees. She makes us run through the orchard while she chooses what apples she thinks we should bring home. She actually does a pretty good job of picking apples. Today's adventure was to bring home apples to be dehydrated into apple chips. Apple chips are a staple winter snack for us. Sour apples keep the best dried flavor so we tend to choose sour varieties and under-ripe sweet varieties. However, not all rows of trees in the orchard are labeled so the variety picked it is often a mystery to us. Today we picked a peck of apples. Sounds like a nursery rhyme I know. A peck of apples is right about 30 apples, give or take, depending on the size of the apples. 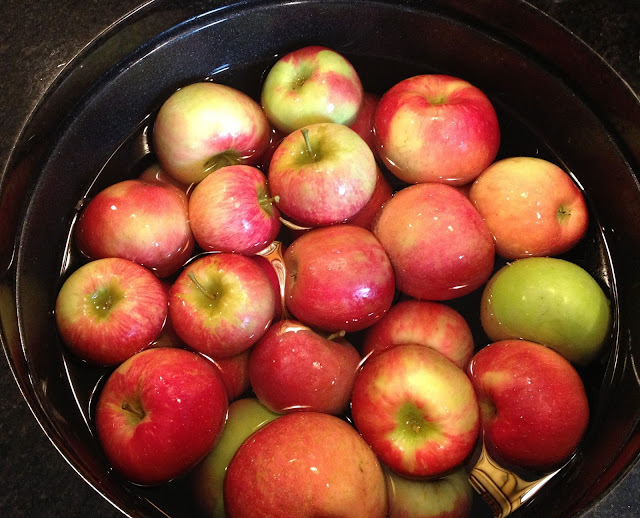 The first thing I do is soak the apples in a clean kitchen sink filled with water and a couple of cups of vinegar. This washes off the outside of the apples not only field dirt but any chemicals that may have been applied directly to the orchard or that have drifted on to the apples from nearby corn and bean fields. After the apples have had a good vinegar bath, one by one I peel the apples with a vegetable peeler then slice them with my apple slicer and corer gadget. I used to have one of those gizmos that would peel, slice and core the apples but it was so hard to keep in alignment it usually ended up mangling the apples which frustrated me to no end. So I unceremoniously dropped it into the recycling bin and got this little baby instead. Yes it makes me peel the apples by hand but frankly it takes less than a minute to peel an apple so it really isn't a big deal. 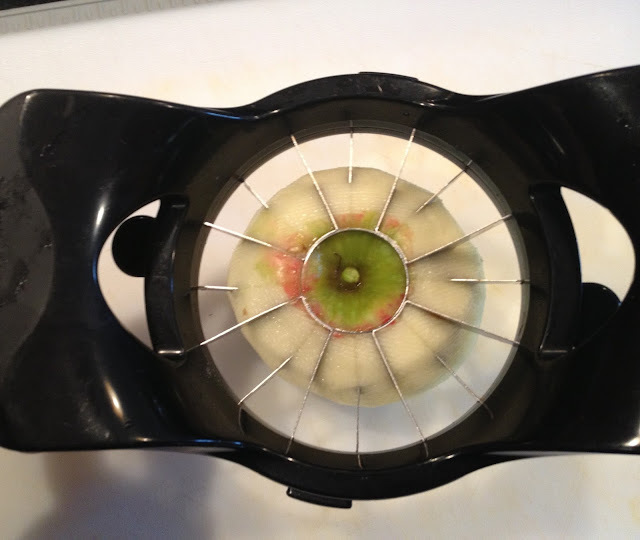 Next I center my apple corer slicer gadget over the top of the apple then cut through giving me nice neat slices. Next I trim off any left over apple peel. The apple peels make eating the dried apple chips unpleasant to me. It is the texture of the peel that I really do not like so I make sure to take all the peel off before drying. After that I arrange the slices on the dehydrator screens fitting them tightly but without touching. I get about two apples worth of slices per level of my dehydrator. Lastly I close up the dehydrator and plug it in. I usually let it run in the garage so the sound of the fan motor doesn't drive me crazy. I will let the dehydrator run overnight. It will take about 8 to 10 hours to dry the apple slices depending upon how thick the slices are and the humidity at the time (also depending a lot on your dehydrator). I like my dried apples to be bendable and a little chewy. Letting the slices continue to dehydrate beyond that point gives a very crisp dried chip that will easily break in half. They taste about the same but I like the chewy texture better. Man, I need a dehydrator! Thanks for linking up to Motivation Monday! If you don't have a dehydrator, you can do this in your regular oven as well. Make sure the apples are sliced thinly (like potato chips), then bake for 6 to 8 hours at 170 degrees until they are slightly shriveled and crispy. Oven dehydrating works great especially on chilly days. I like to keep the oven door cracked open (usually I use a silicon potholder to leave it open a bit) which helps drive the moisture out of the apples in the oven faster and warm up the house. Thanks for mentioning this! I currently have 14 trays of apples going in the dehydrator. I dip my slices in a solution of 1/2 of a cup of lemon juice and 1 pint of water before drying. Oh yes that helps so much with the browning that can happen with apple slices. Not to mention helping to kill off any bacteria trying to hitch a ride and shorten the dried apples' shelf life. Thanks for the comment! I've never had a dehydrator but have often thought of getting one. It doesn't look very difficult at all, just time consuming. It takes less time than it looks; maybe ten minutes to prepare all the apples. The rest of the time the dehydrator does all the work. There are a lot fancier dehydrators out there. This basic one was pretty inexpensive. But now that I dry so many things I am thinking about getting a fancier one (they hold more and allow you to adjust the drying temperature). Thanks for commenting! Seems like a fun idea! thanks for sharing! How do you store the dried apples? I put them in jars or zip top bags in the pantry. Since they are so dry they last for months without refrigeration. We really enjoy dehydrate apples. I need to get some from the local orchard so we can enjoy them this winter. Thank you for linking up to the HomeAcre Hop! We'd love to have you back again tomorrow.